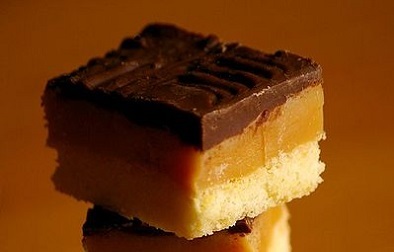 This 7 inch square cake tin is the perfect product if you are looking to make a layered cake for a special occasion, or the magnificent millionaire’s shortbread recipe that is attached to this page. With a diameter of 17.5cm and at 7.5cm deep, this 7 inch square cake tin will be big enough to make almost anything you want. It will also be easy to clean thanks to the double non-stick finish and the fact that it is safe to put in the dishwasher. This is a 7 inch square cake tin so please ensure that is the size and shape that you are looking for before going ahead and purchasing this high quality piece of British manufactured bakeware. So why not add a square cake tin to your bakeware collection as a change to the more readily available round cake tins.